From HABA's new ''pure roots'' line: newly reformulated Squa Facial Foam is a non-abrasive cleanser that emulsifies with water, rinses clean. All the rage in Japan...! HABA's new ''pure roots'' skin care product line contains no parabens, flavors, mineral oils, synthesized tar colorings or petrochemical surfactants that can irritate the skin. Squalane and coconut oil extract work together to cleanse deeply without drying, and leaving no oily residue. Include HABA pure roots Facial Foam in a daily regimen that includes exfoliating, toning, and moisturizing - add any of the HABA Special Care products to focus on specific trouble spots. TrueRenu does the searching - and research - for you, searching the world for hard working, hard to find products that do what they claim. We discovered HABA and we like it because of its high amounts of purified shark liver oil, or squalene. The 99.9% pure result, called Squalane, is extremely dense with oleic acids that are naturally found in our own skin. This makes it a superior moisturizer on its own, but also an excellent carrier of additional nutrients as it penetrates the dermis layer much more deeply than most topical creams and lotions. Choose from a variety of products to create your simple daily regimen: Remove dirt and impurities with HABA pure roots Squa Powder Wash or Squa Cleansing (for makeup cleansing). Tone alcohol-free with G Lotion or new VC Lotion II. Then moisturize with SD Squa Dew, Squa Q10 or Squalane SQ. Further customize your regimen with HABA Special Care products which include Fair Lady (lightening), Squa Q10, Uruoi Densetsu, 2 Way Jell, White Knight, or Umi No Houseki. 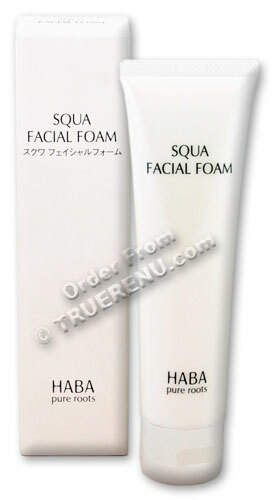 HABA Face Foam is a gentle cleanser with no abrasive particles. You emulsify it before using, and squalane boosts its absorption and cleansing ability. If you'd like to learn more about HABA, try one of the products - and toss our 10-Product Trial/Sample Set (item 4904) in your shopping cart for a luxurious way to sample many of their most popular products. Emulsify small amount of cream in your palm with warm water. Apply to face with a soft cloth, or use a facial cleansing brush for better and gentler exfoliation. Rinse with clean warm water. Follow with HABA VC Lotion or G-Lotion, and finish with Squalane SQ or Squa Dew SD. Add HABA Special Care products to your daily regimen as needed. Ingredients: Water, glycerin, myristic acid, potassium hydroxide, cocamide DEA, palmitic acid, stearic acid, beeswax, cocamidopropyl betaine, PEG-150 distearate, glycol distearate, pentylene glycol, squalane, dipotassium glycyrrhixate, silk powder, sodium bicarbonate. Product Size: Net Weight: 100g, or about 3.5 US oz. The outer hull of the rice kernel is nutrient-dense, packed with over 100 powerful antioxidants like skin-renewing Vitamin E, Oryzanol, and Lipoic Acid. Plus, rice bran is a natural exfoliant - gentler than fruit extracts which can tear the skin.